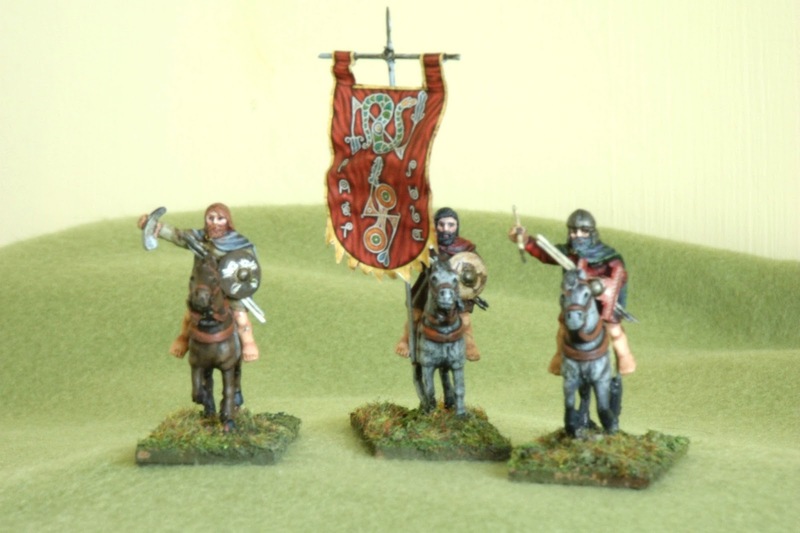 The sources (such as they are) tell us that Pictish armies had a cavalry element. There's good, concrete evidence in the form of a number of Pictish carved stones (groan!) 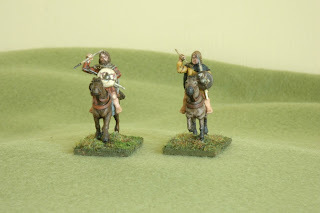 showing armed riders. 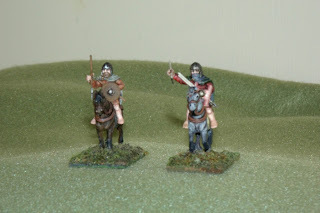 So, my Pictish army will have a couple of mounted units. These chaps are all from Newline Designs. I have bought from Newline a number of times, and they have been great folks to deal with - helpful and very quick. 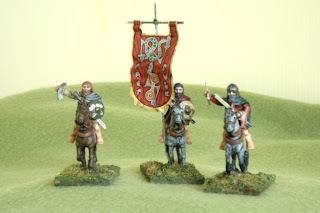 Currently these minis retail at £7.00 for three, which makes them the cheapest mounted figures I know of by a long stretch. 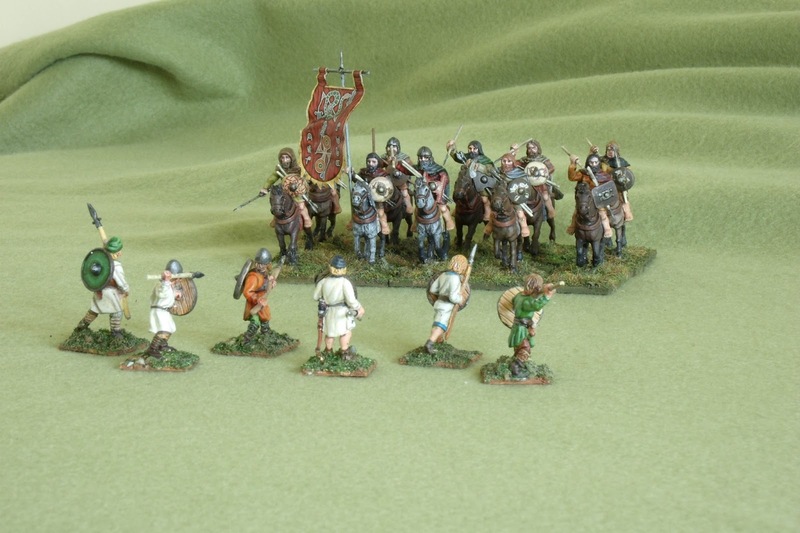 Size-wise, I am quite happy to put them with Black Tree, Crusader, Gripping Beast etc, and their foot figures are included in the size comparison I did here. Newline castings are clean and easy to work with. A softish metal is used and a burnisher is often as much as is needed. It's a simple matter to drill the shield hand to take a few javelins. Poses and animation are generally OK, and quite believable. The riders actually fit the horses very well. Compared to some manufacturers is a bit of a novelty, and others could take a cue form this! There has to be a downside, and unfortunately there is. 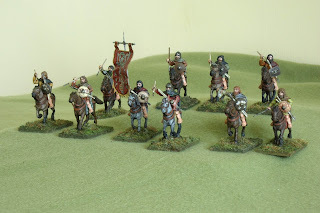 The biggest one is that frankly the sculpting and castings are not as crisp as you would expect from the likes of Crusader and Gripping Beast. You pay your money and take your choice. I would rather put nine perfectly acceptable riders on the table than about six near-perfect ones for the same money. The other, lesser issue is that the range of poses in a set like this is quite small, but let's face it, Newline don't have any monopoly on this. If you are willing to trade time for money (and I almost always am...) you can remedy this quite easily. It's a simple matter to reposition arms and hands, add longer hair and beards, or sculpt in a hood or a helmet. In a couple of cases I replaced the heads with new ones from Redoubt's ECW bare heads packs, and I'm quite happy with the result. All of that aside there is one other thing I dearly love about these figures. The horses! A lot of the time when you buy ancients cavalry the horses are slender, long limbed beasties that would not look out of place at a modern flat race. The horses from Newline, with their deep bellies, broad muzzles and thick limbs are exactly like the sort of "primitive" breeds Picts might have ridden around on. 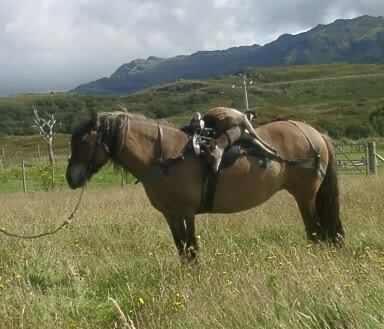 Pictish horseflesh was more likely to have resembled this, a Highland pony, than anything with finer lines. What a Pictish horse should look like. Another thing is that the sculptor has actually managed to put the eyes in the right place. On the side of the head. I bought some model horses once and the sculptor had put the eyes on the front of the face! 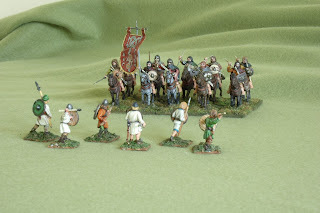 Here are the whole lot, with home-made shield decals, as described here. I tried making a banner the same way, but it didn't quite come off. OK, it actually didn't work at all, and was a total bust, so I put my hand in my pocket and bought a banner sheet from someone who really knows what he's doing: Steve Hales at LBMS. This worked an absolute treat, as usual, and looks fantastic. They look very nice. I really rate the Newline ponies, too!